Hello, Welcome to my HGSS (Heart Gold, Soul Silver) Tutorial. This tutorial will be based around Photoshop, but most of the things will apply to Paint as well. 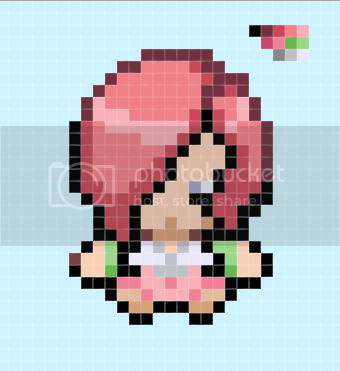 The Sprite, is in a Rpg Maker XP format as that is what I use the sprites in. EDIT: Finally, if you are using Photoshop, I add groups, Two main groups, Hair and Clothes then four sub groups on each, Up, Down, Left, Right, This way it makes it neet and tigdy for everyone to see. I have split the pallet into two partsto mkae it easier to view. To make it easier, have the colours for each area going darkest to lightest (Visa Versa) As seen in the example above. 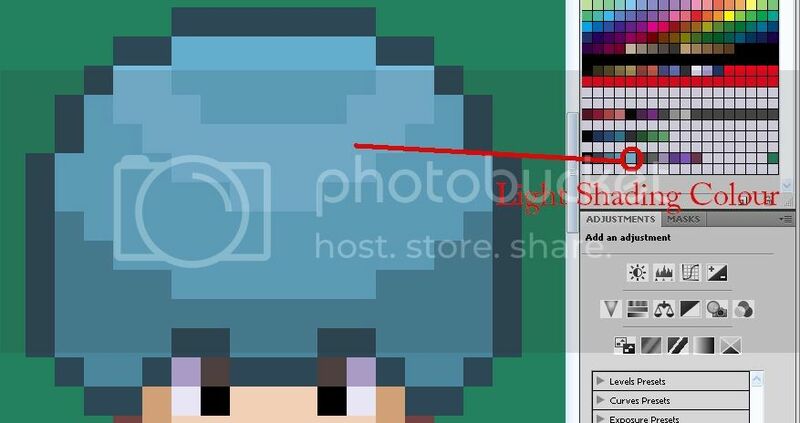 For this tutorial, I will be using Clair's Hair Pallet and Morty's Clothes Pallet. As shown below. The Skin Pallet is not shown as it is on the template above. 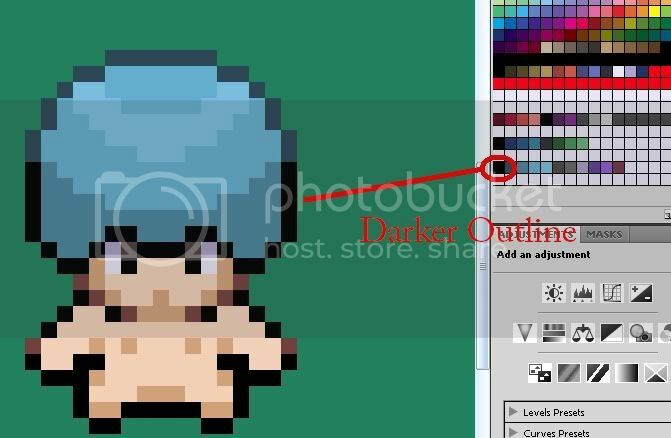 So, get the darkest colour (Not black) and Draw the outline as shown below. Next, fill in the WHOLE INSIDE of the outline using the Second brightest colour in the 'Hair' Pallet. OK, now that we have the outline and the filled in hair, we need to add some shading, I start with the darker colour first. 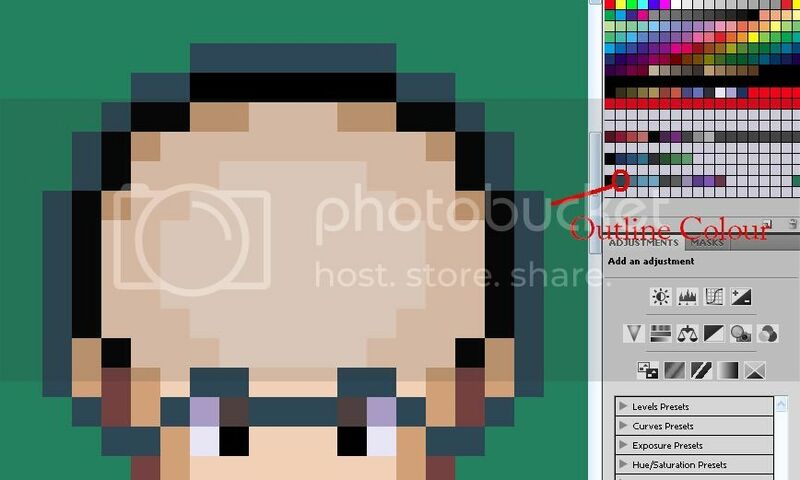 (This is the one in between the outline colour and the 'Fill in' Colour) And shade the areas which is at the bottom of the hair and where there are details (Just underneath). Seeming as the light source is mainly above the sprite. Shading is shown in the example below. Here is the example for light shading. There we go, the hair of the sprite is completed. That is about whater 75 / 9 is (9 because the three front view, 3 back view and the three side view (Only three because you can just flip the side around to get the other side...)) Next up is the clothing. Clothes, are needed for any sprite, unless... NO I am not going any furter lol. Anyway, like in the number 2 area, you need the pallet. This is easy if you did the steps in number two. Like I said, I will be using Morty's Clothes Pallet. OK, like with the hair you need to make an outline... (You will need 2 different outlines, (The Shirt, Trousers)) I normally start with the shirt. I use the one of the darker colours on the clothes pallet as it is going around the body, if you do not get what I mean Look at the diagram below. Thanks, this will be useful, one I learn I won't have to bug you as much. Jk but nice tutorial. I see, what program is needed though? Oh that's a bummer I only got paint. 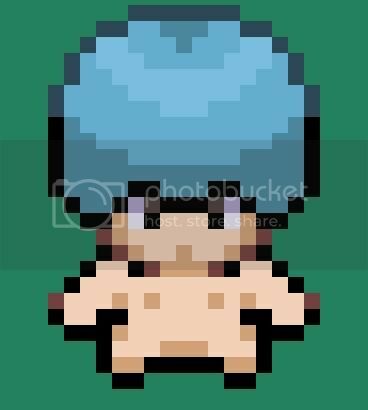 Photoshop is nice to have, but isn't necessary for spriting. I only use paint for spriting, and I like to think my sprites turn out nicely. This tutorial is pretty good, although your advice on shading hair doesn't always work. 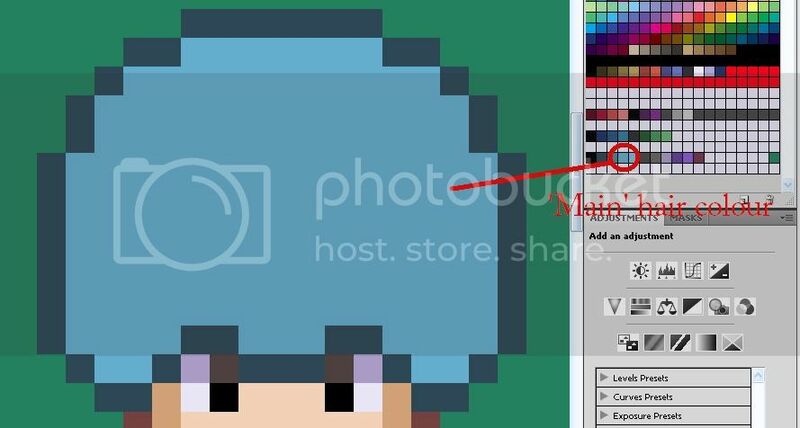 It does with a bowl cut like that, but with more complicated cuts the shading changes.